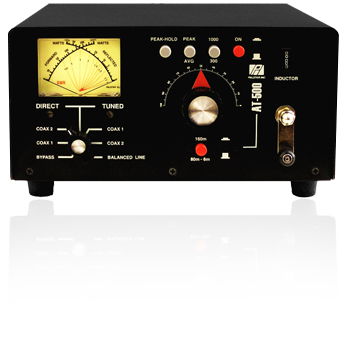 The Palstar "HF-Auto" Tuner is capable of a maximum power rating of 1800 watts (2 to 200W carrier power when tuning). There are no clacking relays or stepper switches used in the device, but continuously variable components like a roller inductor or a large plate capacitor to ensure for a perfect match every time. The HF-Auto provides three arbitrary antenna outputs that are selected either manually or automatically depending on the frequency. Alternatively the tuner can be switched to "bypass" mode to deactivate it. Once settings for good SWR are found they can be saved automatically, which makes tuning next time even faster. The serial interface is used to upgrade the firmware, a serial cable is included. Palstar plans to launch a remote-controlled version of this tuner, however a release date is not available yet. Power supply requires 12V, a DC cable with a connector for the tuner is included. Power supply: 13.8V DC, 4A max. The Palstar HF-AUTO-R is the full-function remote control unit for use with the HF-AUTO automatic antenna tuner. The HF-AUTO-R allows for remote operation of the HF-AUTO base unit up to 150m away and duplicates all buttons, controls, and display info. The combination of the Palstar HF-AUTO and HF-AUTO-R will allow for high-power remote operated analog autotuning with a power rating of 2 Watts to 1800 watts. To operate a null modem cable is required, which is not included. Finally a Palstar tuner with the traditional high quality and feature set has become available for low power as well. The compact tuner Palstar AT-500 can handle max. 600W transmit power. The Palstar AT-2K tuner is a manual antenna tuner for shortwave and 6m. By using the three controls (2x variable capacitor, 1x roller inductor) you get very accurate and precisely reproducible tuning results. Varicaps are tuned via a 6:1 reduction, the smooth-running roller inductor via a big crank. These components have, accordingly to its maximum allowable transmitting power of 2000W PEP, a very high voltage resistance. Impedance ranges from 20 to 1500 Ω for frequencies from 1.8 to 30 MHz, on 6m impedance is a little less. Connect with the mode switch two different antennas either directly or via tuner to the transceiver. An additional output to connect balanced antennas is available, an optional 4:1 current balun is recommended (not included). The built-in dual cross-needle meter shows forward and reverse power as well as the resulting SWR. Switch max. measuring range of the meter from 300 to 3000W. A 'Peak and Hold' function makes it easier to read the meter. Power supply requires 12V, max. 200mA. Very similar to the AT-2K tuner is Palstar's AT-2KD. It is identical in all respects except it just uses one varicap, which also differs slightly in design. This simplifies tuning a bit, at the expense of accuracy. The even larger AT-5K is built very similar to it's smaller brother AT-4K: a manual tuner with a T network design, with switchable balun for symmetric feeds. The max. power of the AT-5K is 3500 W CW (approx. 4000 W PEP). Due to the large capacitors the impedance range on the 10m band is limited. Operation on 10m is possible, but only with better adapted antennas. The Palstar BT1500A is built for exactly one reason - to tune balanced antennas best possible. There is no trade-off with coax fed antennas nor with unbalanced feeds. As with all large tuners from Palstar, the AT-4K has a large cross-needle display with backlighting. Switching meter range from 300 to 3000W provides instant overview of forward and reverse power as well as the resulting SWR. The meter has a 'Peak and Hold' function to read peak values more accurate and easier. Power supply requires 12V, max. 200mA.